Happy Easter, everyone! In the spirit of spring and new growth, I've been planning to plant my very first garden. There's already a rosemary plant, irises, and lily of the valley in the front flowerbed, but I'd love to add some herbs that I can use in the kitchen & a few magical plants for good measure. Hello homemade smudge sticks! So far my wish list includes: basil, sage, chamomile, mint, lavender, mugwort, hyssop, geranium, and one of these beauties. 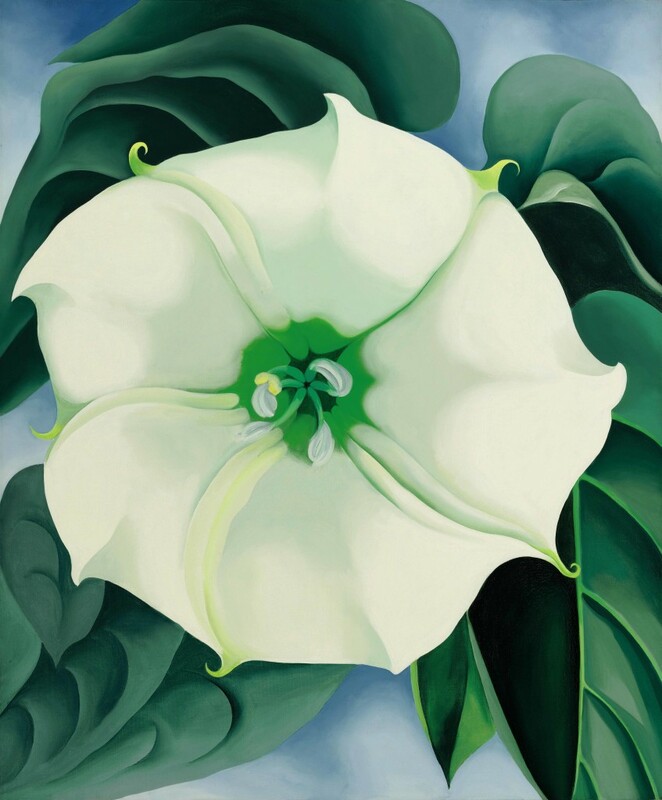 I came across this painting by Georgia O'Keefe (one of my favorite artists) earlier this week and was utterly fascinated. It's called Jimson Weed, a folk name for the datura. Ancient Aztecs used them in ritual to produce visions, and early settlers called it devil's snare due to its ability to cause total delerium. The flowers open at night, hence its other common name: the moonflower. How magical! Esme Wang's brilliant series of guest posts, Off We Go, chronicles the intersection of entrepreneurship and mental illness. This week, Beth Kirby of Local Milk shared her beautiful story of learning how to manage comorbid diagnoses and a successful blog & business. It's raw, it's spiritual, and it's beautiful. Thank you for sharing, Beth. On top of having the best name ever, Rebecca Tracey's new series Nice Package is a fantastic resource for online biz owners who want to package their services so they'll sell like hotcakes. Make sure you check out her interviews with Kendrick Shope and Lis Digjan this week: your wallet (and your clients!) will thank you. Feeling cluttered? These 16 ways to improve your habitat in 5 minutes or less from Rosy Blu Handmade will do the trick! Rock and Roll Bride's thoughts on how to be an artist will inspire you get off the couch and start creating, stat.